Fed Meeting: More Caution than Expected! 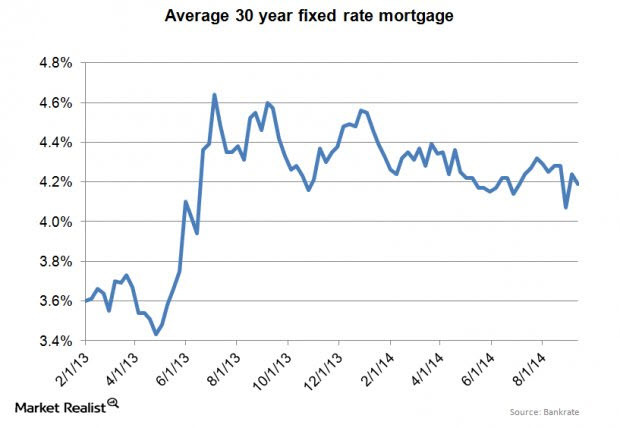 Mortgage rates are the lifeblood of the housing market. This is why the Fed began quantitative easing (or QE) in the first place. Lower rates allow homeowners to refinance. Refinancing increases homeowners’ disposable income. It also helps stimulate economic growth. Lower rates let first-time homebuyers move out of an apartment and into a house. This means higher consumption and benefits for home improvement retailers like Home Depot and Lowe’s. Consumption accounts for ~70% of the U.S. economy. Over the past several months, mortgage rates and the ten-year bond yield have stopped correlating. Last week was no exception. The average 30-year fixed-rate mortgage decreased 5 basis points to close at 4.19%. The ten-year bond sold off and yields increased 15 basis points. Recently, mortgage rates have been stuck around 4.25% even though bonds have been rallying. The issue may be that originators are beginning to extend credit to borrowers that they would have turned down last year. Over the past year, the only loans that were getting done were conforming loans and high-quality jumbos. Many originators are now beginning to originate stated income loans—not to be confused with liar loans of the subprime days. These loans will have a higher interest rate than a generic Fannie Mae 30-year loan. That could explain why mortgage rates increased. If this is the case, this could be the impact builders were waiting for. Tight credit has been a problem for builders for a long time. The Upfront Mortgage Professional website is now launched Nationwide. Perfect timing as rates hit their lowest in 2014. Find the most honest and transparent mortgage loan officers and processes with the UMP 10 POINT GUARANTEE. NEW YORK (MarketWatch) — Long-term U.S. Treasury yields fell again this week after data showed the pace of new-home sales in July fell to a four-month low, and now have hit a new low for the year pushing mortgage rates down. Yields move inversely to prices, falling as prices rise. The U.S. 10-year Treasury note yield (10_YEAR) fell more than 1 basis point to 2.33% Friday. U.S. Fed Chairwoman Janet Yellen said Friday that the Fed’s focus is “naturally shifting” to a debate over when to hike interest rates, as the U.S. economic recovery is nearing the Fed’s objectives. Short-term note yields are more sensitive to rate-hike speculation than longer-term bond yields.